Marketers often search for products that help them earn immediate brand recognition and goodwill. Last month, a majority of our customers ordered products from us to spread awareness about their brand, sports team or cause. They believe in our products to deliver an efficient marketing campaign for them. Are you looking for promotional products that help generate maximum brand impressions? Check out our bestselling promotional products for May to get a few inspiring ideas. The Gildan Safety Green T-shirt inched its way to the top as expected. It is light-weight, has anti-odor properties and is perfect to wear for the gym, office or outing. You can gift this t-shirt as a welcome gift to new employees or potential customers! It will keep your recipients cool while highlighting your brand! A perfect trade show handout, this key tag is an ideal way to show patriotism while promoting your brand. These Flexible Key tags will also work great as employee gifts and will take your logo places! Another great item for your customers, this Quick-Open Letter Opener is priced below 1$! They can also be distributed as office giveaways for brand marketing. Constructed out of plastic and featuring a stainless steel blade, this letter opener will do the job of opening letters and spreading brand awareness effectively! These fun and colorful pens make great promotional gifts. They are cost-effective, attractive and write smoothly. Hand out these pens at trade shows or retail stores. Your logo, company name and contact details will always be at close hand for customers and employees. The custom Freedom Tumbler is a brilliant gift idea for the summer season. It is double wall insulated, BPA-free and available with our free 24-hour rush service. It comes in several color options and good for basically any business promotion. This tumbler is an efficient way to put your logo on display all summer long! These Wristbands with USBs are hugely popular with high school and university students. They are durable and offer large imprint area for 0aximum brand recognition! These cool-looking sunglasses are offered in a range of attractive colors. They make great trade show items and party favors. These Junior Neon sunglasses come with UV protection lenses that shield eyes from harmful UVA and UVB rays. Your recipients will surely be impressed with this show stopper gift and remember your brand name for a long time. This stylish Cam Drawstring Backpack is a marketing hit! The camouflage pattern gives this bag a tactical edge. Made of polyester, it is lightweight and durable. Your logo will be highlighted on these bags wherever recipients take them. This impressive Alchemy Notebook Combo ensures customers remember your brand every time they jot down a memo. Use it for business outreach, employee appreciation, and even as trade show giveaways. The Notebook includes 80-sheets of lined note papers, a matching alchemy pen, and an elastic pen loop. Citation Wine Glasses hogged the limelight last month! They are durable, timeless and classy. These glasses can be used as trade show giveaways or as favors for weddings/anniversaries. It also makes an excellent addition to shelves at restaurants or offices. With a large imprint area and lasting durability, there’s no doubt these wine glasses will help make a lasting impression! 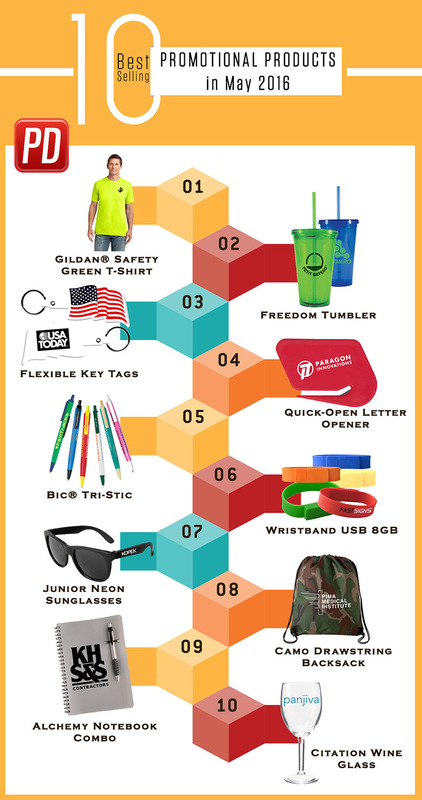 This was a quick overview of Promo Direct’s 10 best selling promotional products for May 2016! Stay tuned for our top-selling list for June! To learn more about our wide range of promotional products, call our dedicated account manager at 1-800-748-6150.